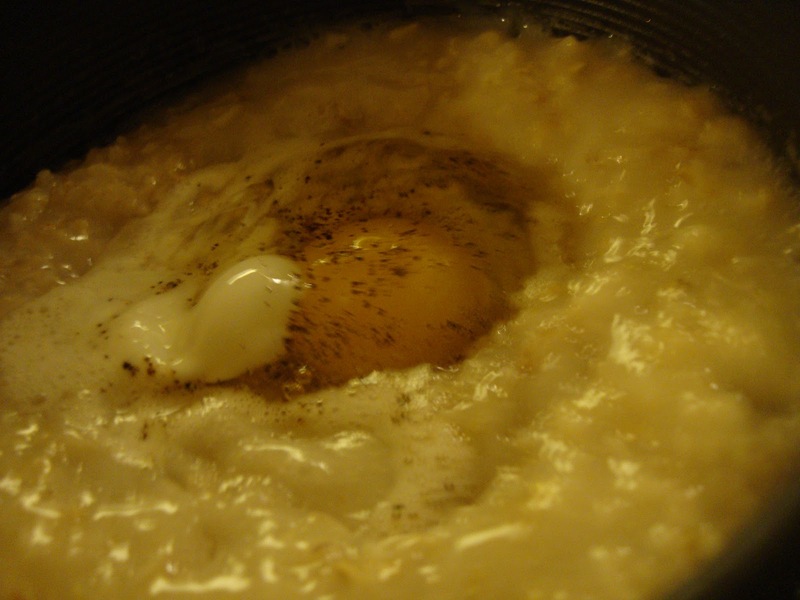 I’ve never heard of porridged eggs, though my experience is that very little is truly new. We’ve just lived too long. For a few weeks, off and on, they kept coming to me. I love the idea of oatmeal because I know my body, my heart, needs whole grains and oatmeal’s tops. (Read about the great oat here.) But I also find that I operate better (and eat less) during the day with a protein for breakfast. Especially in cold Minnesota. Hence oats and eggs. But how? During the calorically dense holiday season, it makes sense to have a great, quick fish meal in your pocket….This one’s a winner. Saute onions, garlic, and broccoli. 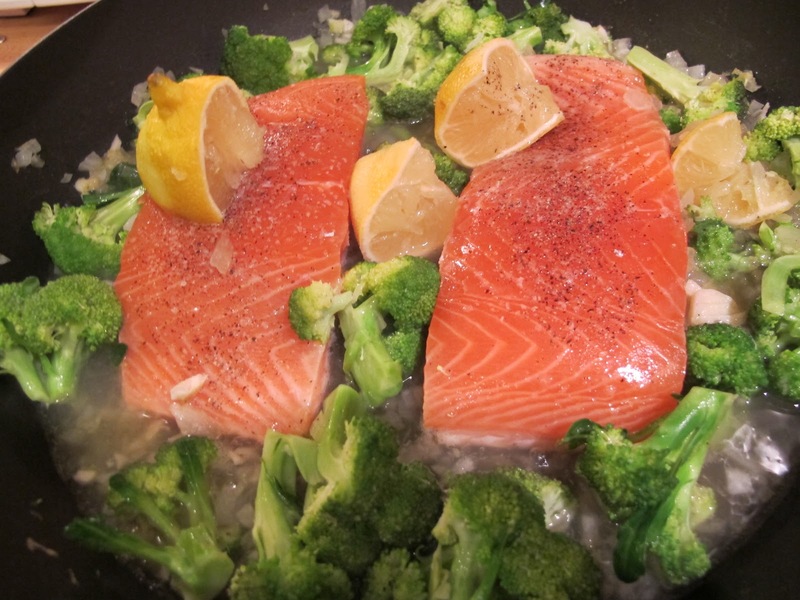 Add wine, lemon juice and salmon filets. Cover and cook just a few minutes. Dinner’s served! Sing a new song! Cook something new! 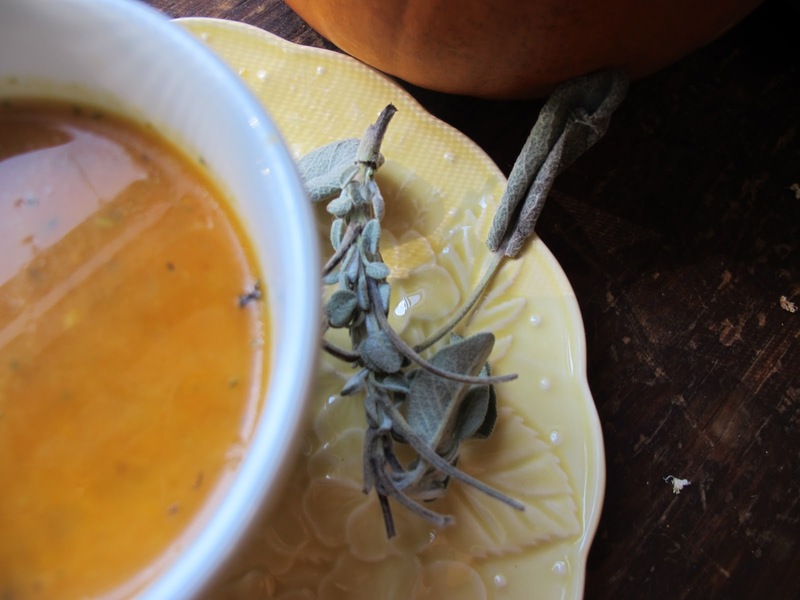 Make this soup on Friday and curl up on the couch to watch the first Christmas Movies! 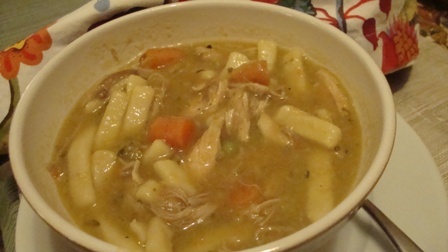 Turkey Noodle Soup from Thanksgiving Leftovers…Including that gravy if you like. This soup is made in two stages: one to create a quick stock and the other to make the soup. Please read all the way through before beginning. Cook’s Note: The Turkey Soup police are not out today. You can make this with lots of changes and substitutions, but you have my idea to start. Blessings on your soup pot! Be brave! Place all of the above ingredients into your largest stock pot. If you have a big 20 quart shrimp pot, use that. If not, simply use your largest pot. 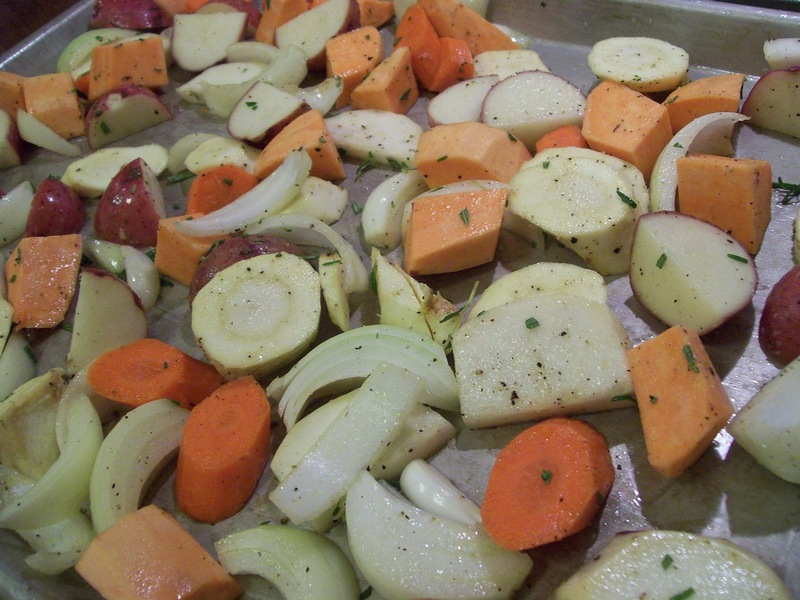 Pour in enough water to cover the carcass and vegetables and place on stove over high heat. Bring to a boil, lower heat to a medium boil, and let cook an hour or so. Add more water if necessary to keep all of the ingredients fairly-well covered. Strain all of the stock and ingredients through a sieve or colander and discard solids. You may fish out the vegetables and puree them for the soup if you like. Be careful to make sure all of the peppercorns are out of the stock. You now have the basis for your soup. To the stockpot of newly made stock, add all of the above except the last four items (noodles – hot sauce.) You must use your own judgment about how much liquid to add depending on the amount of vegetables and stock you have leftover, as well as how large your stockpot is. You may add water, as well, if you haven’t enough stock. All of the vegetables should have lots of room to float freely and there should be lots and lots of broth. The broth will reduce (cook down), but you’ll still need plenty later to cook the noodles. (Think about cooking pasta.) Bring everything to a boil and lower heat to a good simmer. 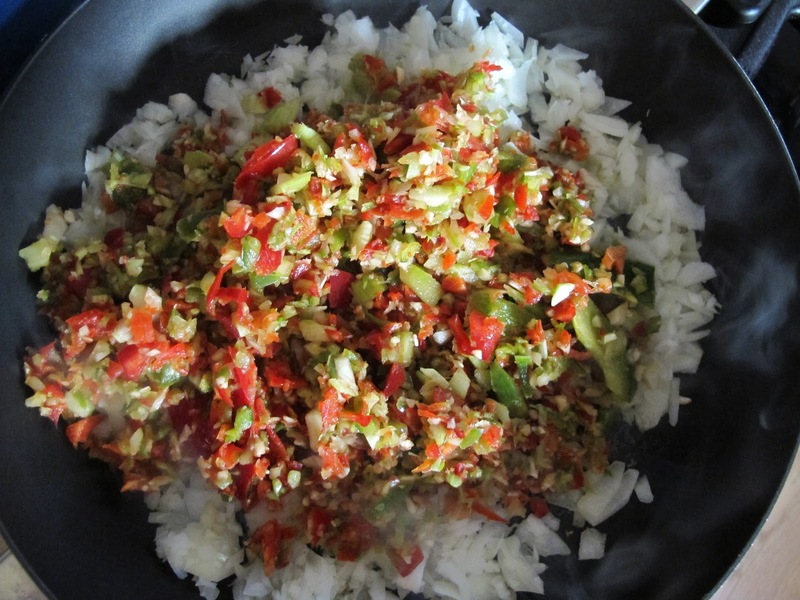 Cook until the fresh vegetables are beginning to soften, stirring regularly. Add the frozen noodles and cook in the broth as directed on the package–about 20 minutes. Throw in the peas for the last few minutes. Taste and adjust seasonings, adding salt, pepper and hot sauce, if desired. A few drops of hot sauce will deepen the soup without heating it up, but be careful you don’t over do it. Total cooking time for this second stage should be 30-40 minutes. 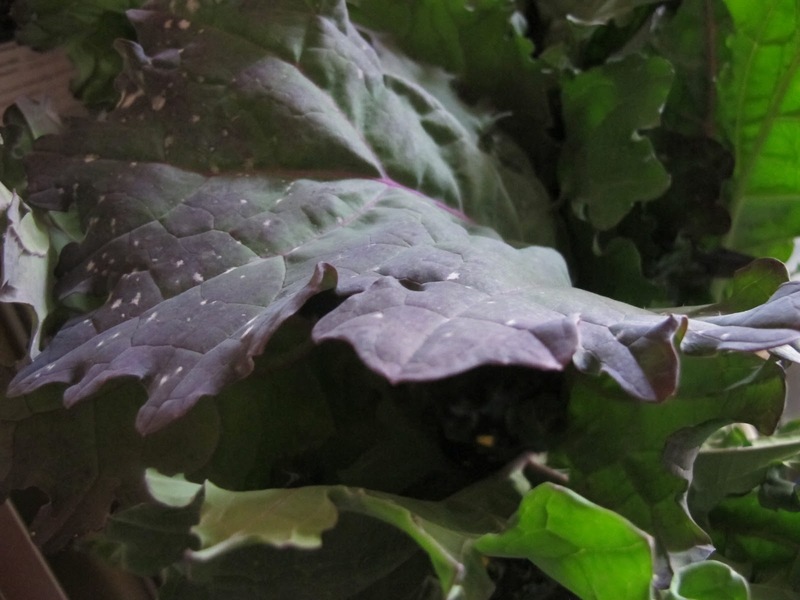 *If you have leftover cruciferous vegetables (broccoli, cauliflower, turnips, etc.) you might want to add these in just the last five minutes of cooking so they do not flavor the broth. **You might have some leftover turkey stock from cooking the giblets, etc to make gravy and stuffing; throw this in if you have it. If you don’t, you’ll use more boxed broth or water, if necessary. ***If your’e out of turkey meat, you can still make this soup; it’ll be tasty, filling, and nutritious anyway! This “recipe” originally published elsewhere by me! The underlining won’t disappear; I’ll try later to reformat it. Until then, you have the soup and the underlining. 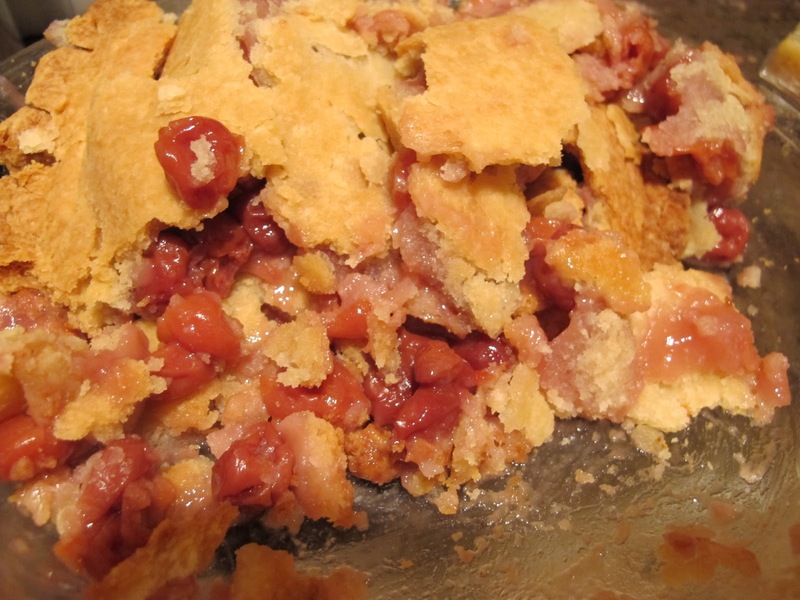 A Cranberry Thanksgiving Day or How To Get the Kids Involved in Thanksgiving! 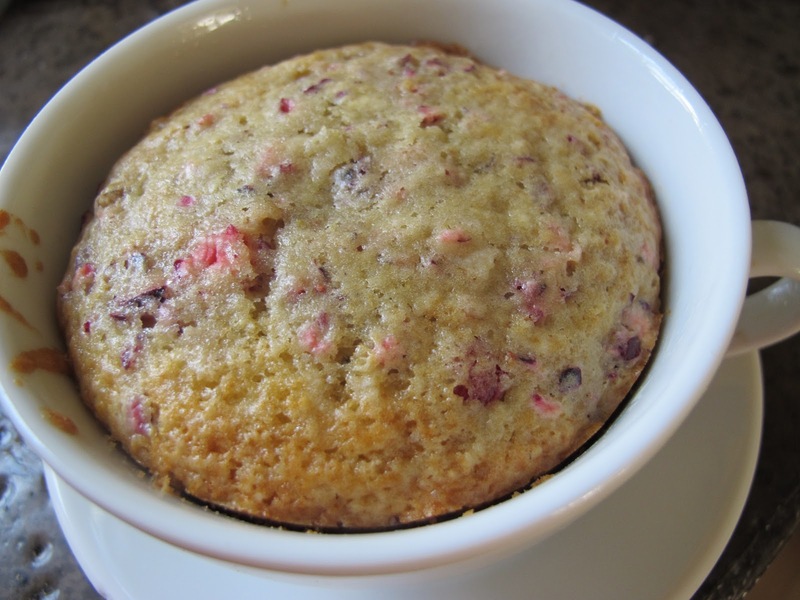 for large size muffins or in tiny pans as little gifts for special folks. Apilco (French porcelain)–all their tableware is oven-safe. 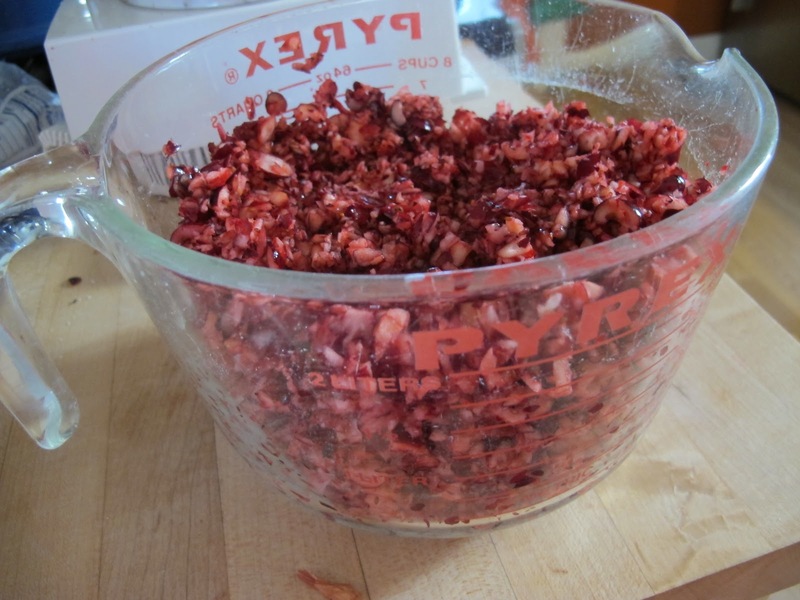 Finely chop all of the cranberries (fresh or frozen) at once by hand or in food processor. 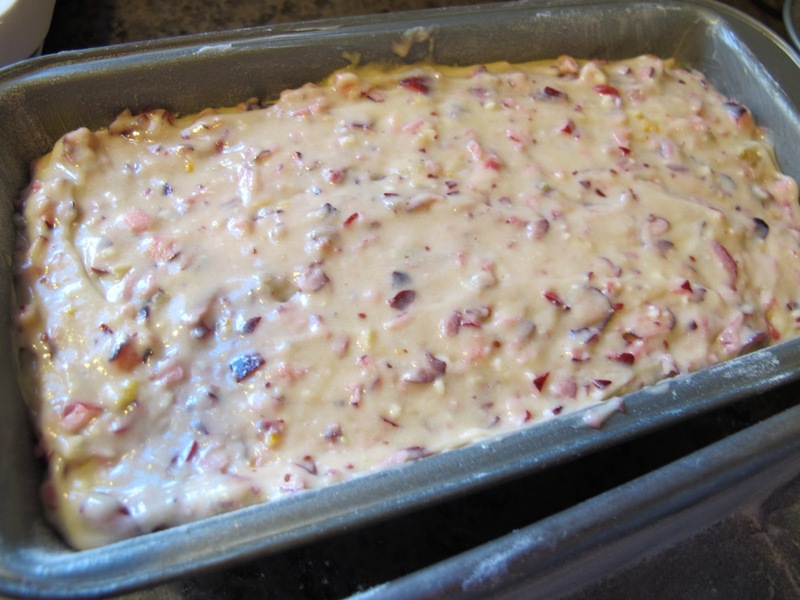 Then: clean the food processor or board well; the red will color the bread you’ll mix or stain the board. Peel the oranges and chop finely all of the peel in the food processor or by hand on the board. Of course you can grate it using a rasp or metal grater, but I think it’s too fine that way. 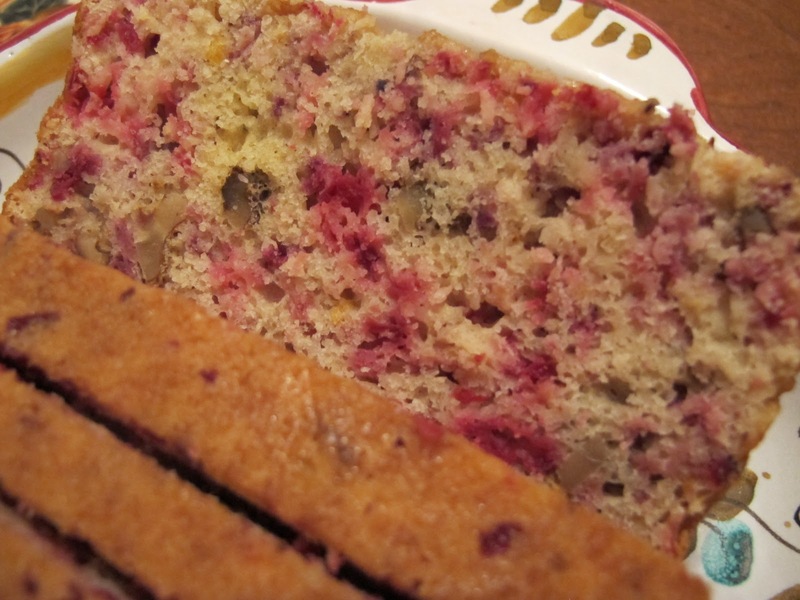 The recipe is based on one from CRANBERRY THANKSGIVING by Wendy and Harry Devlin. Reading this book and making the bread is a fun, yearly Thanksgiving activity…..
to which children love becoming addicted. (Also adults like me. My kids are long gone and you see what I’m up to.) 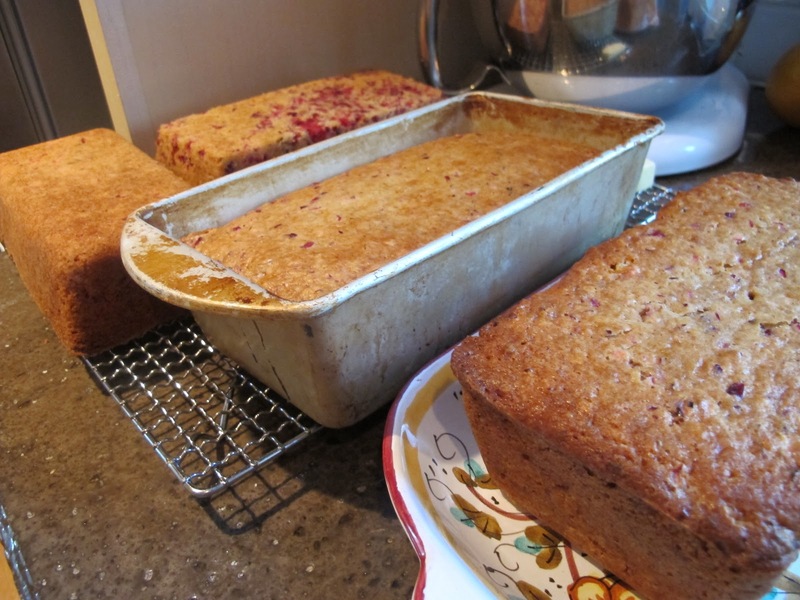 The story involves a fabulous cranberry bread recipe, for years kept secret, and an unscrupulous special someone who appears to want to steal it. 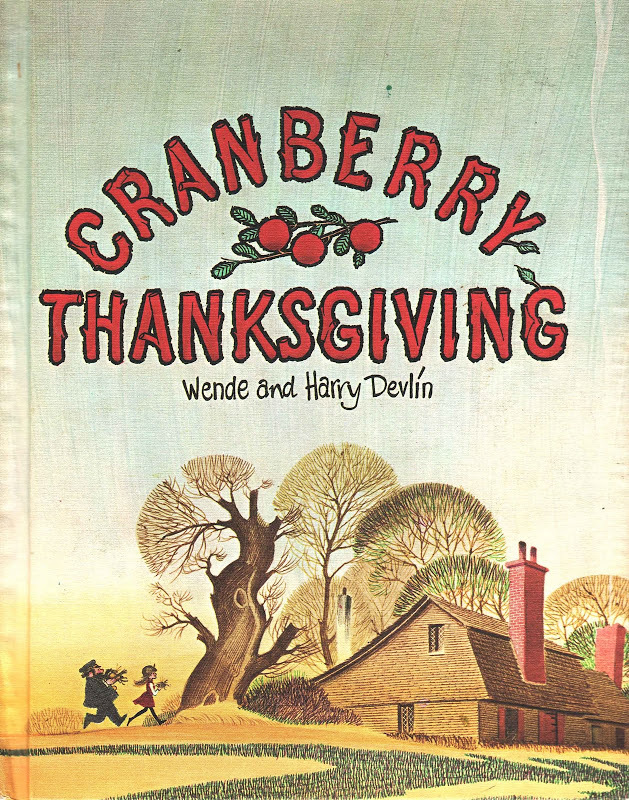 Of course, all’s well that ends well, and the Devlins went on to write all kinds of other books about cranberries…. The book itself is again available (was out of print), but I found a couple of first edition copies at the Good Will this fall for $1.99. I can’t locate it as an ebook; maybe you can. 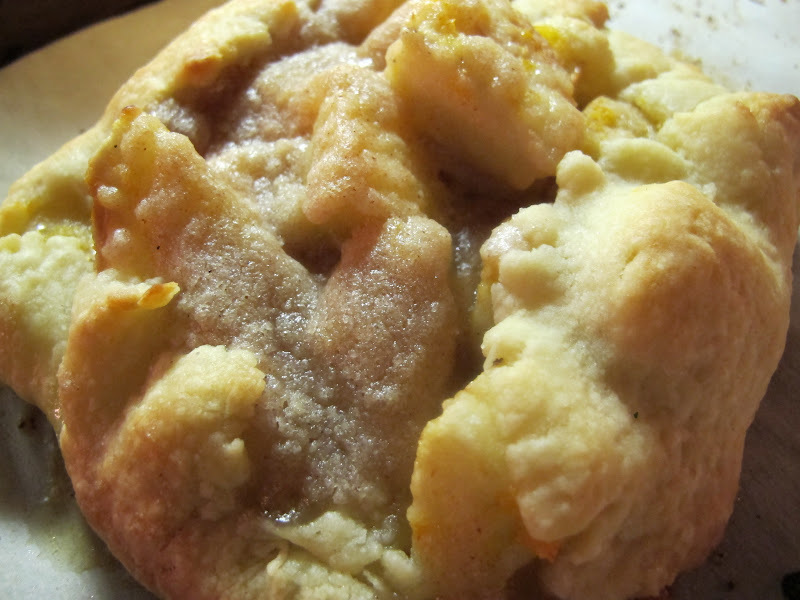 The library will definitely have copies, but check yours out early and write down the recipe! Here’s the original recipe along with the Devlins’ Blueberry Pancake Recipe. 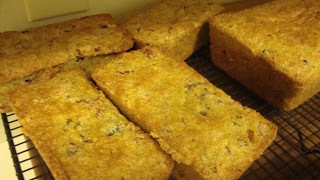 While I occasionally make a loaf with or without nuts, add a few tiny chocolate chips, or combine the recipe with one for bananas or apples, generally I make this bread with just cranberries. 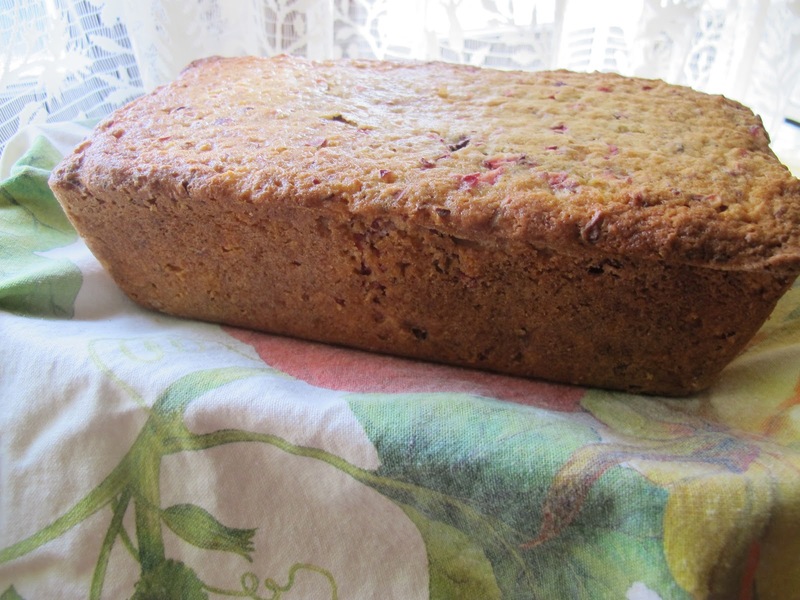 I will probably post the Cranberry Bread sometime soon, but just in case I don’t– here’s the recipe, which is based on the bread in Harry and Wendy Devlin’s book CRANBERRY THANKSGIVING-a fun Thanksgiving children’s book. Enjoy! Preheat oven to 350 degrees Fahrenheit. 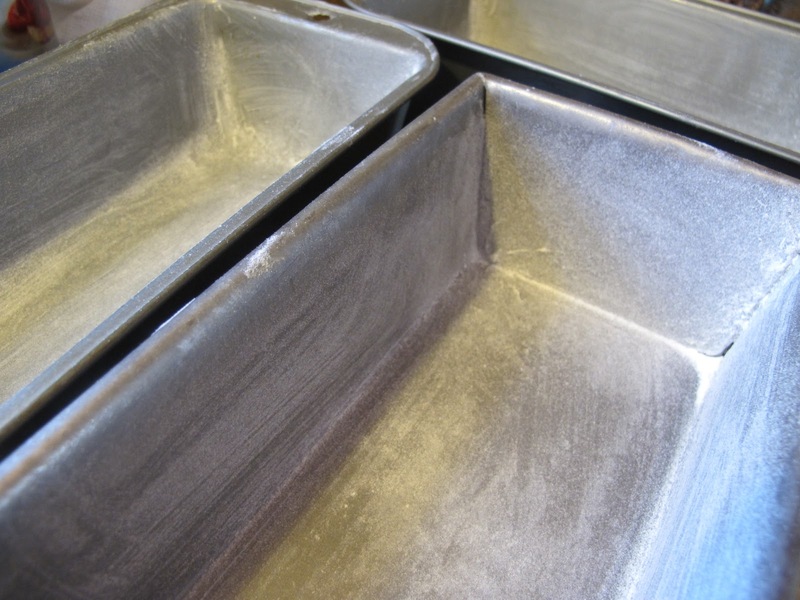 Grease well and flour one 9×5 loaf pan. 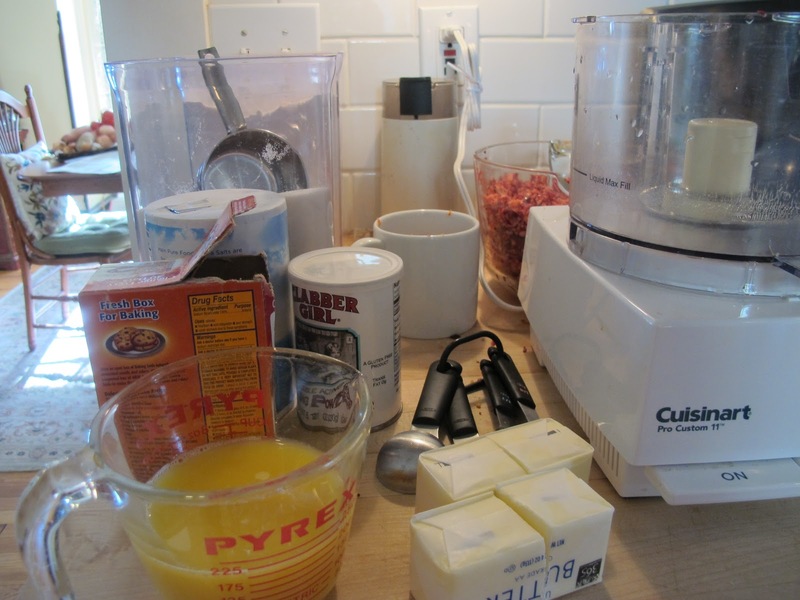 *Can use food processor, but mix cranberries/nuts in by hand. Involving the Kids: Just do it! Don’t worry about the mess or how much time it takes. Just do it! Little ones are great at collecting ingredients, greasing and flouring pans, measuring, mixing, and checking to see if the bread is done. Do the chopping yourself (if you’re doing it by hand) unless your older child already has good knife skills. 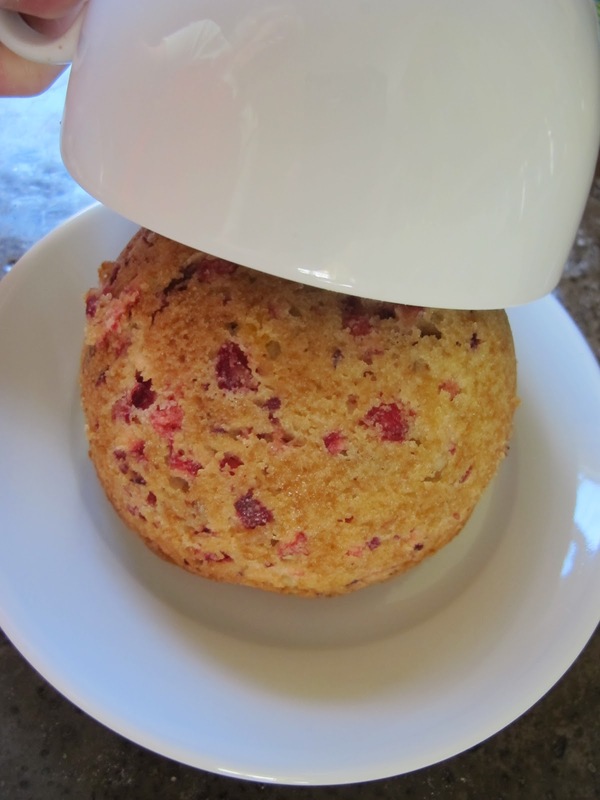 Cranberries are not easy to chop–they keep rolling around, though the job isn’t terribly time consuming. 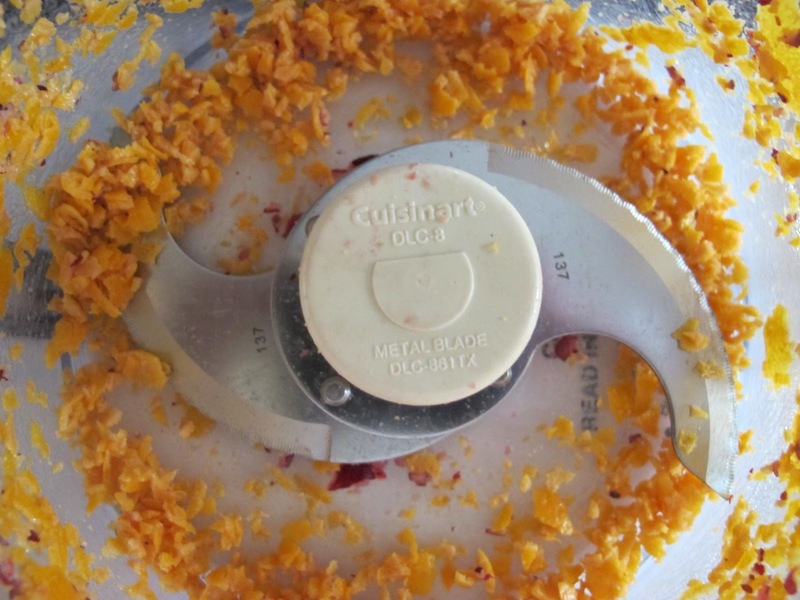 If you have a food processor or manual chopper, this is the time to use it. 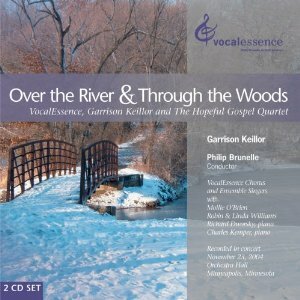 If you’d like to teach “Over the River and Through the Woods,” let them watch this youtube video. Thanksgiving is my favorite holiday. You could have guessed. My worlds all come together on that day. 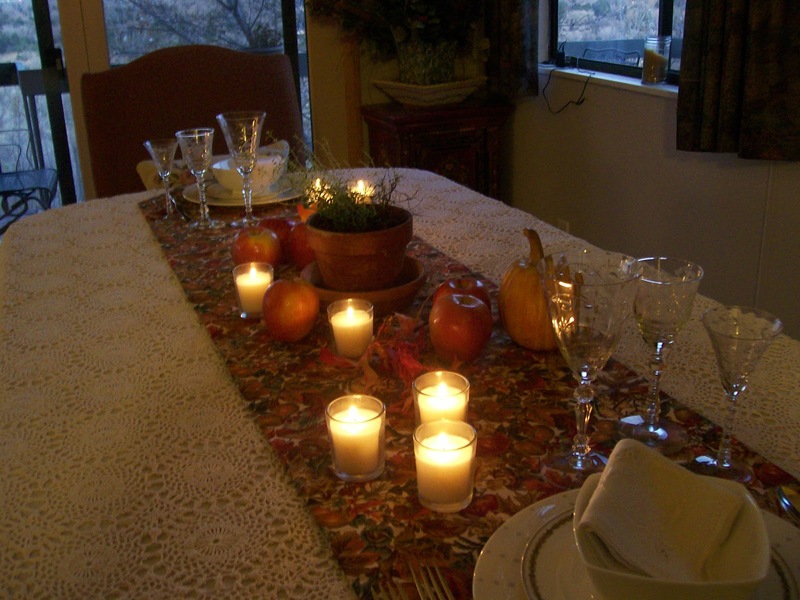 Giving thanks– being grateful–is a practice or discipline of many religions and cultures, including mine. 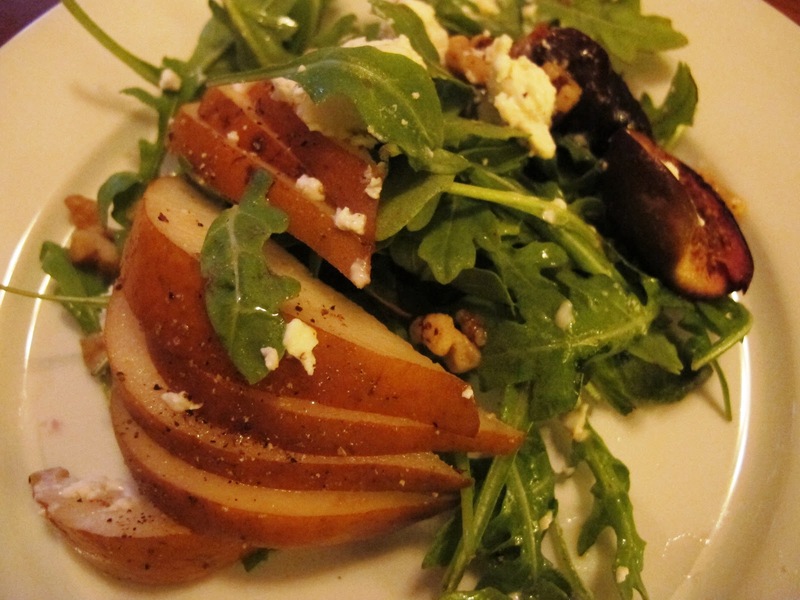 Creating a meal to honor that…is my idea of a great day! I wish you a day of totally beautiful, grateful life. A grace could be very simply giving thanks for the hands that made the meal, for the workers in the stores, on the trucks, in the gardens and the vineyards. Even a toast to all who made it possible would work. Mark the moment. 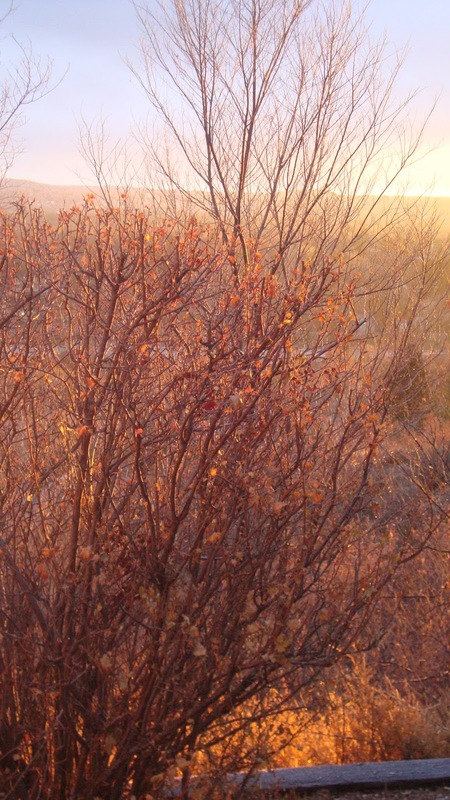 Thanksgiving, after all, is a word of action. Awareness. Awakeness. Appreciation. Peaceful breath. A table that includes something you love. Some of the best new scripture these days is found on paper napkins. Ah, that we have to print that somewhere. 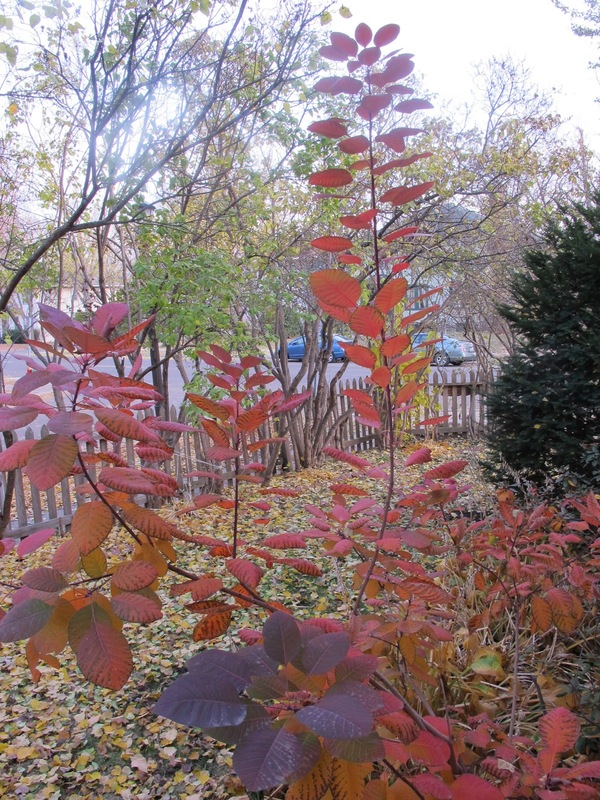 Deep breaths and a sense of warm wonder to you as you prepare to give thanks this year. If the only prayer you said in your whole life was, “thank you,” that would suffice. In case you need help with the meal…. 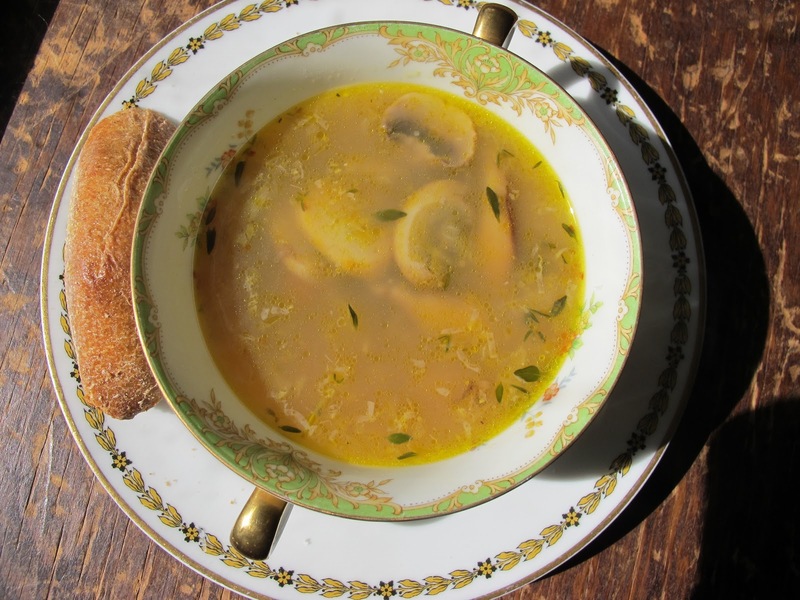 Two Mushroom-Red Onion Soup from my upcoming book. 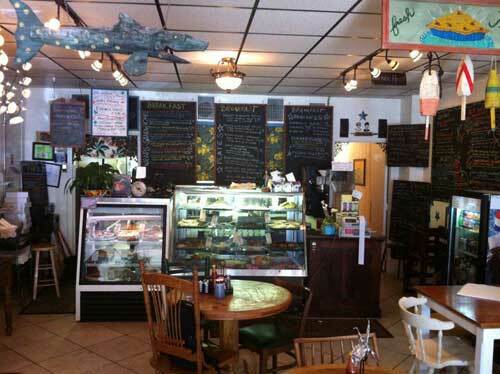 *Reynolds’ Turkey Tips: 800-745-4000 Open through December 31, 24 hours a day, 7 days a week. (888) 674-6854 from 10a.m. to 4 p.m. Eastern Time, Monday through Friday. Closed weekends and holidays, except Thanksgiving. 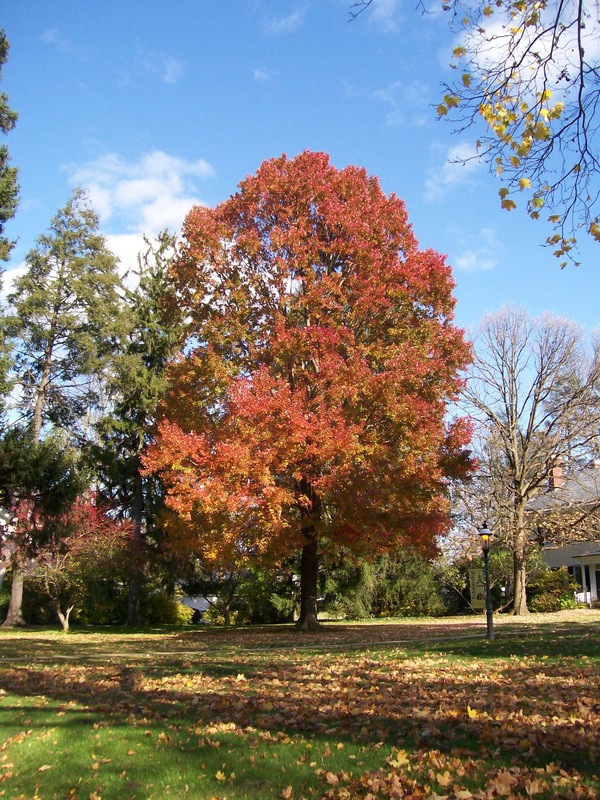 Special hours of operation on Thanksgiving are 8:00 a.m. to 2:00 p.m., Eastern Time. It is of course possible to dance a prayer. 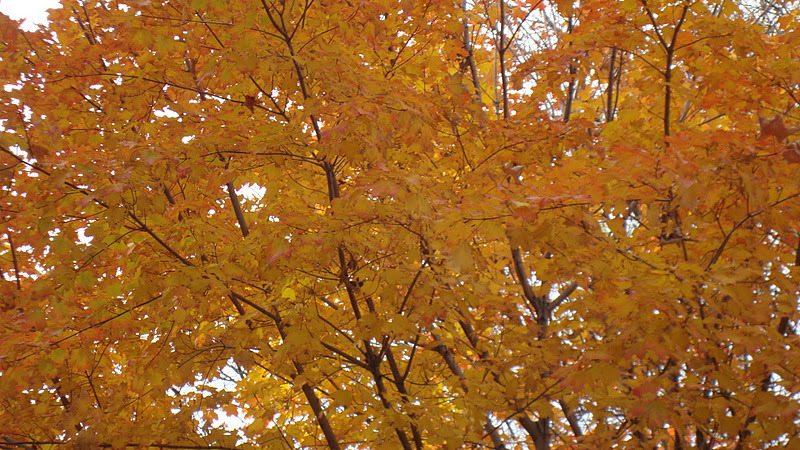 Download Mary Chapin Carpenter’s Thanksgiving Song here. Watch Charlie Brown Thanksgiving on youtube. Thanksgiving Day Football Games–Networks, Kickoff, etc. But such a heart whose pulse may be Thy praise. I could reinvent the wheel here and give you step-by-step, day by day, but here’s a list of places that have already done all that work. Have at it. 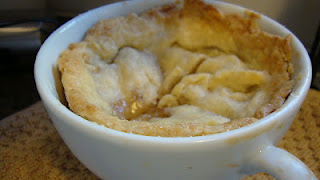 Below that, I’ve listed some of my own favorite recipes or menus from this blog or Dinner Place, Cooking for One. I include an Intimate Thanksgiving, which is a Thankgiving for two (with leftovers) or for four (not too many leftovers.) It was created for those who really don’t have much time to spend on Thanksgiving, but want a special meal nevertheless. 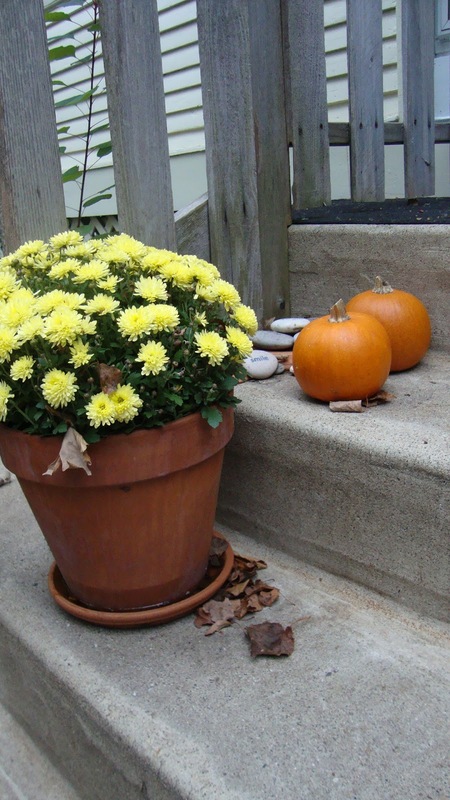 Melissa Clark: What Can I Actually Prepare Before Thanksgiving? 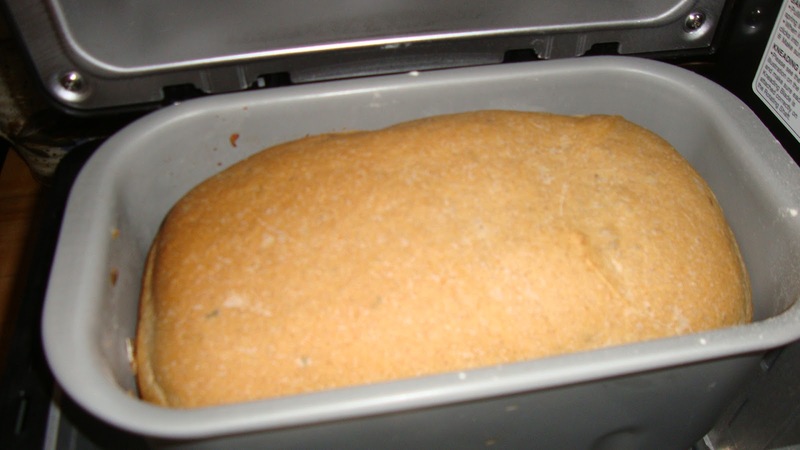 Maybe it’s a good time to pull out the bread machine? 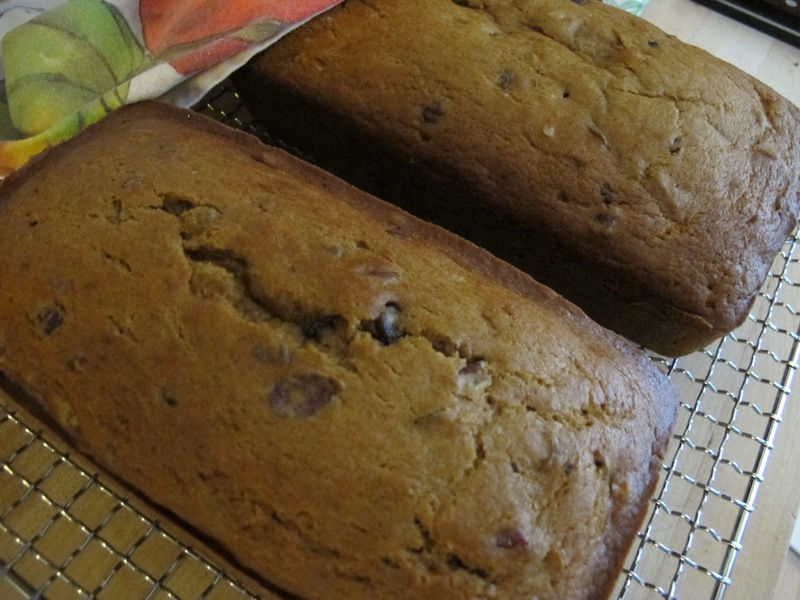 Pumpkin-Chocolate Chip Bread. Thanksgiving morning breakfast. Need extra wine glasses? Borrow them! If you’d like a large inexpensive set to keep from year to year, and can’t spend much: go to the dollar store or a discount place like Marshall’s. You can store a couple of boxes in the closet or basement and have them available for loan or a February Sangria party. Wine is for your enjoyment and the enhancement of food. So, do not fret and fuss about the wine (or anything.) First and foremost, you should drink exactly what you like with Thanksgiving dinner. If you have no idea what you like, go to the wine shop or liquor store, and find a salesperson who’s willing to talk to you. Do not do this on the Wednesday before Thanksgiving unless you’re a glutton for punishment. Everyone else in the city will be there and the clerks will be infinitely hassled while wondering what they’re having for Thanksgiving and who’s going to cook it all. Tell the salesperson what kinds of wine you (and your guests if you know) like, what your price is (don’t be shy), how many people you’ve having, and what your menu is. 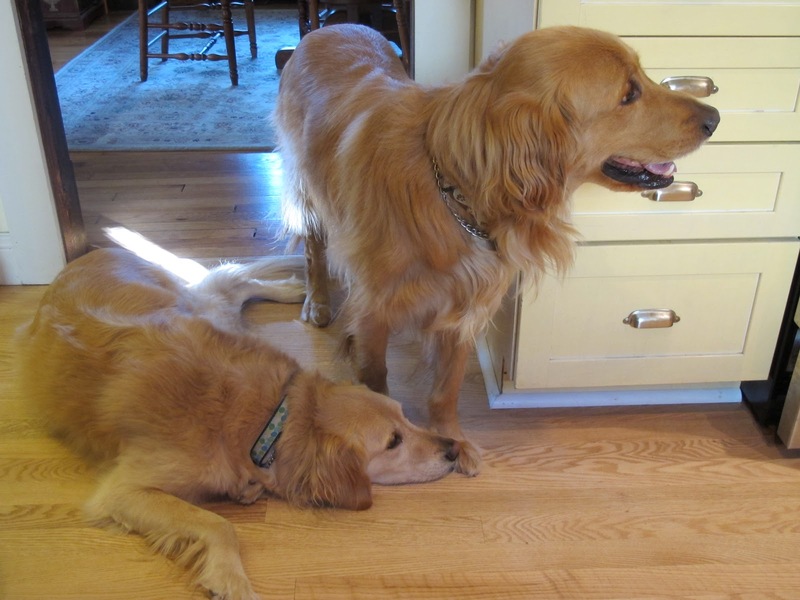 Believe it or not, everyone is not having turkey, dressing, and pumpkin pie. This person has paired vegetarian lasagne, pumpkin ravioli, goose, steak, and an all-raw menu before you arrived. A. One bottle of wine per person (total) is the rule. Yes. You’ll be there for hours. I like American wine for Thanksgiving, so my recommendations are based on no wine from outside the United States. B. Overall: Provide a sparkler for before dinner or apertif, then one white and one red to make everyone at least closer to happy. Some sort of after-dinner drink or digestif is needed as well, though a walk will help, too. I don’t like a cocktail before this kind of a meal…too many calories and too much alcohol, but then again, I’m a wine person. Have beer on hand. Get your brother-in-law’s favorite so he’ll be quiet or choose a saison, which would pair admirably with the meal if he won’t drink wine even with food. Have lots of non-alcoholic choices. Sparkling water is pretty in a wine glass and is good for digestion for everyone, actually. Non-alcoholic beer (Kaliber is about the best), iced Ceylon tea, and plenty of plain water are good choices. Coffee is necessary; have the pot ready and start it when you sit down to dinner so people can help themselves. 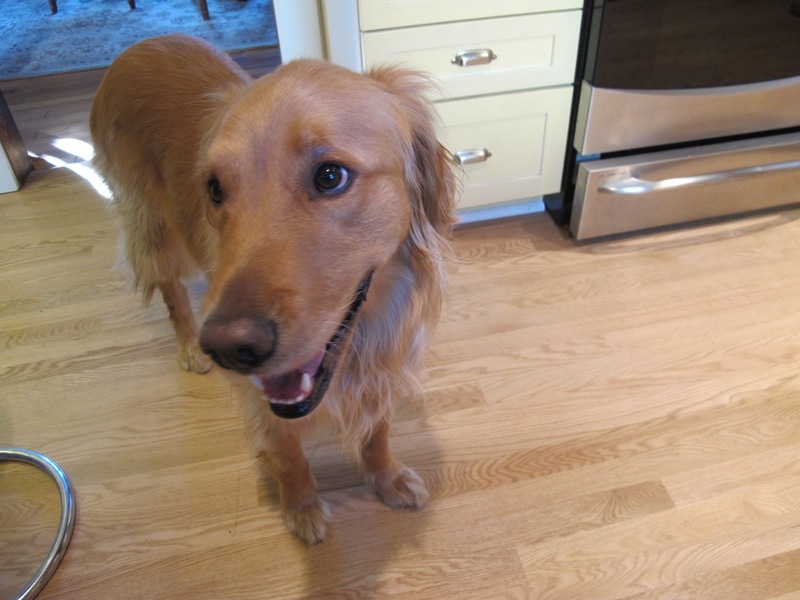 Some will want it immediately after the meal even if they’re happy to wait hours for dessert. If you don’t drink coffee, borrow a pot. You can’t skip it. C. For the sparkler, buy a New Mexican sparkling wine like Gruet. I suggest Riesling for the white (Washington state, Oregon, or New York). The lower the alcohol content, the sweeter the wine. The alcohol content is printed on the label. So if you like sweet, get an 8 or 9% alcohol Riesling. 11? Much drier. Don’t know? I’d go with the sweeter for a group; you’re bound to have people in who want sweeter wine and your red will definitely be dry. The red: Oregon Pinot Noir. It’s a splurge and it’s worth it. If you need a lower-price Pinot Noir, choose A-Z or Angeline. If you simply don’t like Pinot Noir (why? ), buy a good California Merlot. By the way, if you decide you like the Oregon Pinot Noir (and I’m a Pinot girl), buy a couple of extra bottles and squirrel them away in a cool, dry place for next year. This wine doesn’t have to age terribly long to be scrumptious, but it’s usually better with a few years under its belt. The older vintages are sometimes available, but not always. If they are, they’re a lot more expensive. Buy them young. 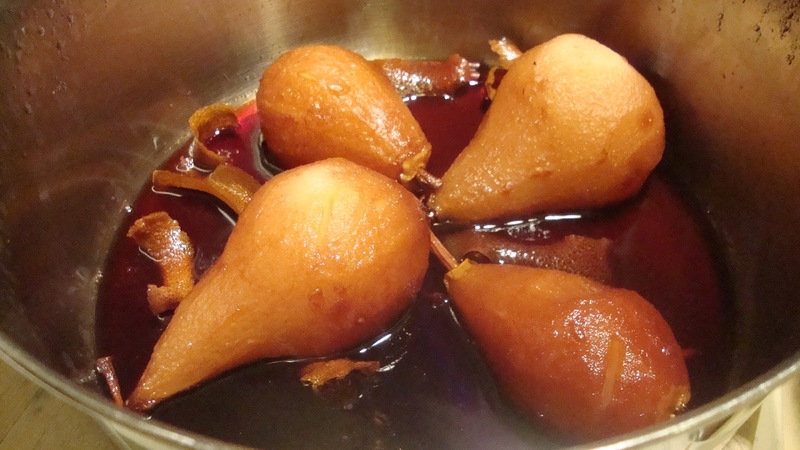 D. If you’d like a dessert wine, American sherry–or port– is lovely with pumpkin pie. A little nip of Jack in the coffee would do no one from below (or even above) the Mason-Dixon line any harm. Save the Irish coffee for St. Patrick’s Day. 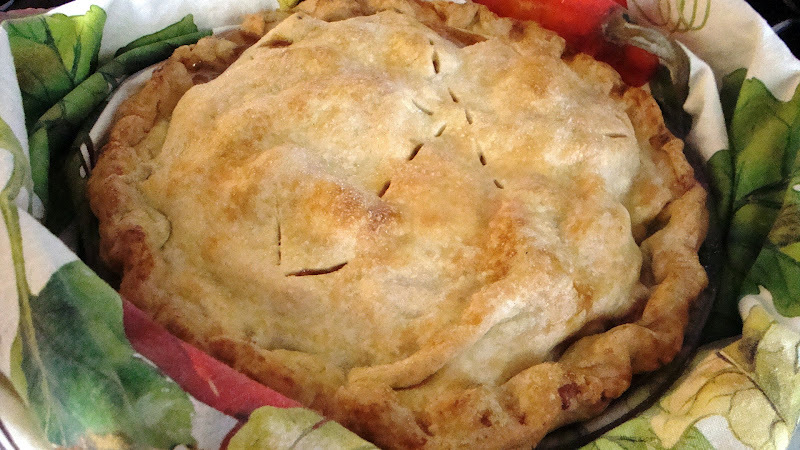 Almond-Scented Pear Crostata from More Time at the Table. On Thanksgiving Day, all over America, families sit down to dinner at the same moment – halftime. 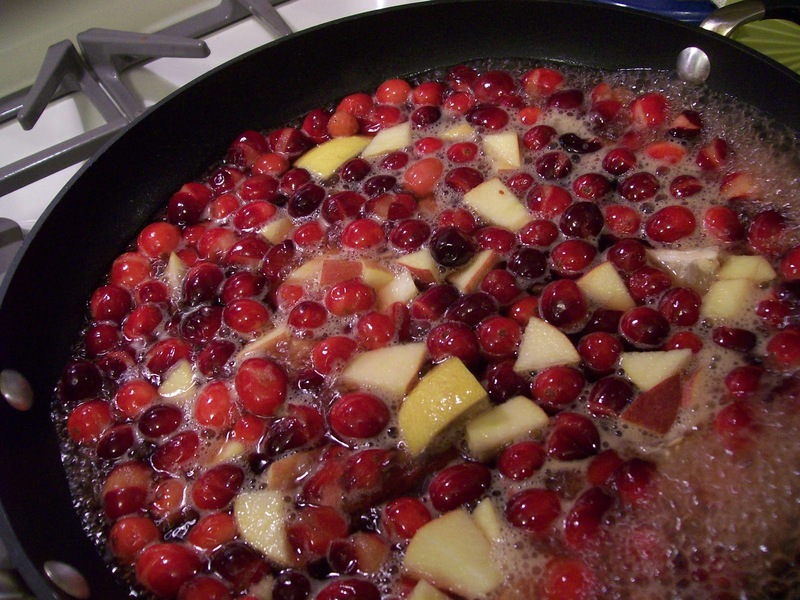 Hot and spicy Cranberry Sauce cooking in the pot. It’s done quickly and can be done a day or two ahead. 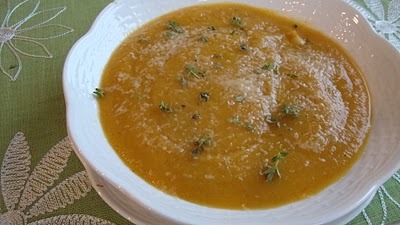 My pumpkin soup topped with Parmesan and chopped peanuts. 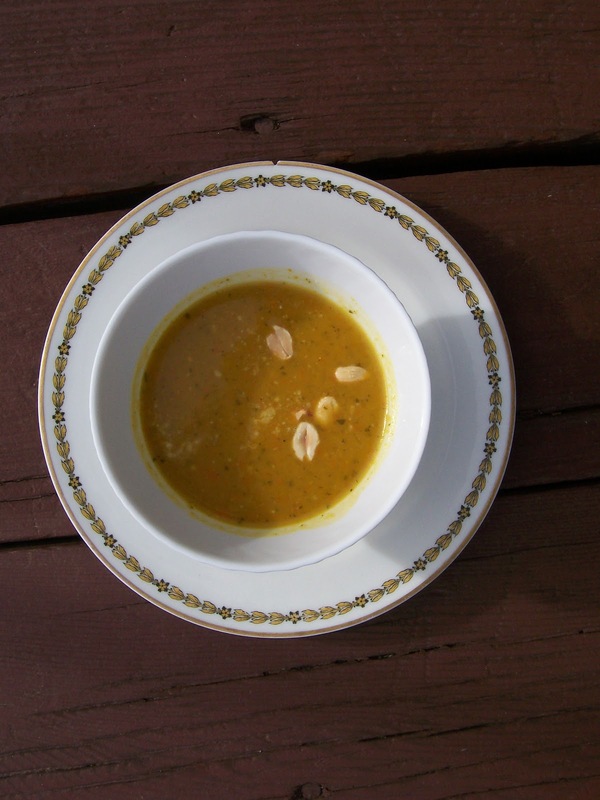 A nutritious soup for a first course is elegant and will help keep folks from overeating. 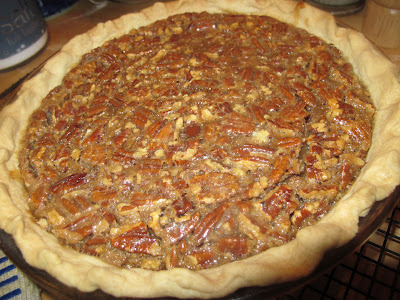 Pecan or Derby Pie is a great Thanksgiving choice. When else would you make it? Don’t bake? 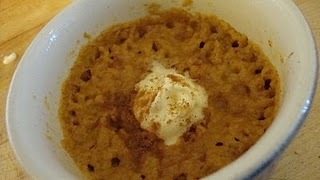 One-Minute Pumpkin Custard with Creme Fraiche. 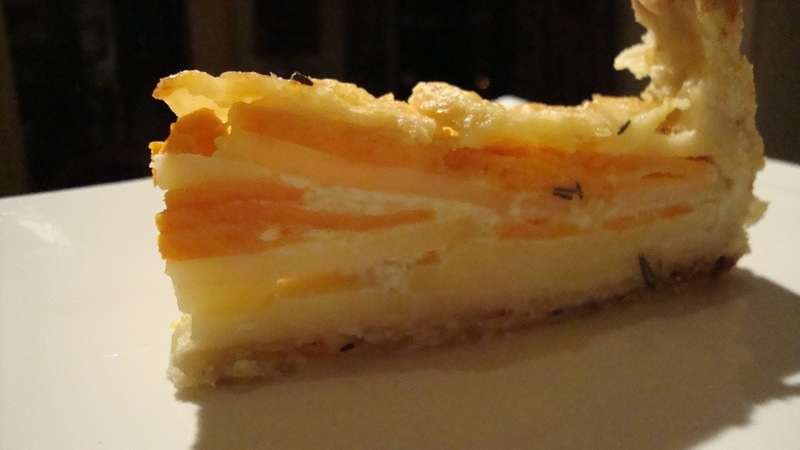 Potato Gratin with Rosemary Crust. No mashed potatoes or gravy needed. Or anything else really. Whatever menu you choose, have fun with it. Make things you like. Let people bring their favorites so everyone is happy. Don’t worry if the gravy has lumps or the turkey is cold. No one cares if your plates match, but they do care that they’re invited. If your heart is warm in welcome, everyone will have a great time. And toast the sturdy Pilgrim band whose courage never ceased. 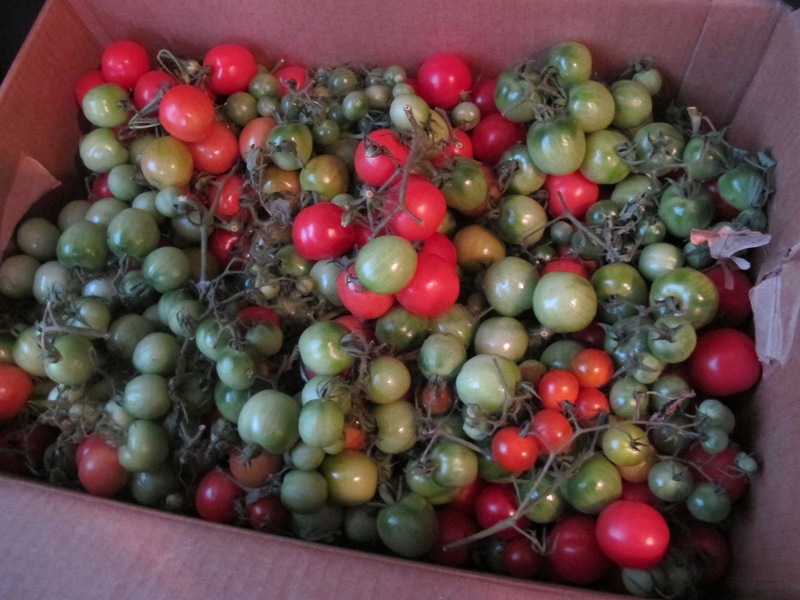 BTW, those are still cherry tomatoes from our garden on November 8. 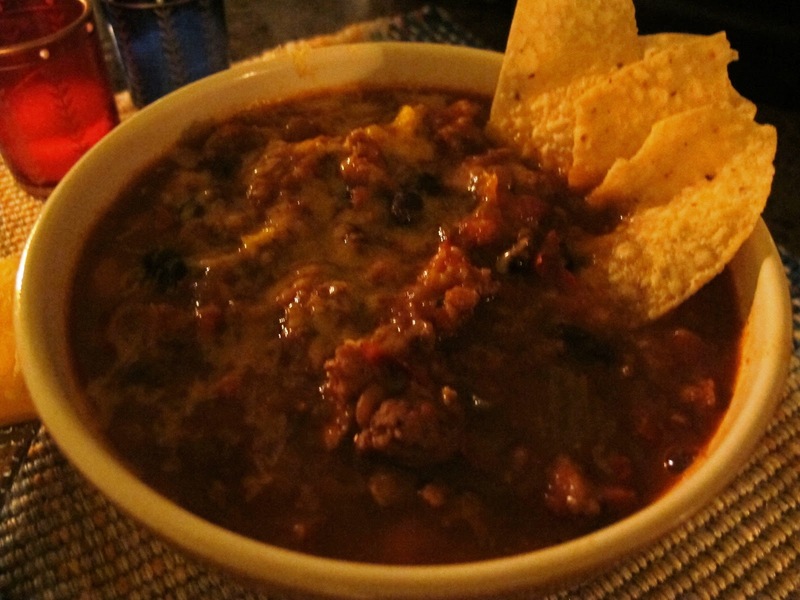 While chili is a quintessential American fall meal, it is often eaten as is. Just a bowl. Just a spoon. Just you and your chili. 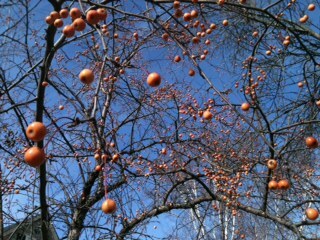 Fall in our ‘hood–tiny, dried crabapples against a St. Paul blue sky. The chili mostly stands alone, I guess. Or at least just with chips, cheese, onions, sour cream….or on hot dogs or fries. Ha. So I made some brown rice and a little salad. For grins, I put it all in the bowl together. Now I do it all the time. 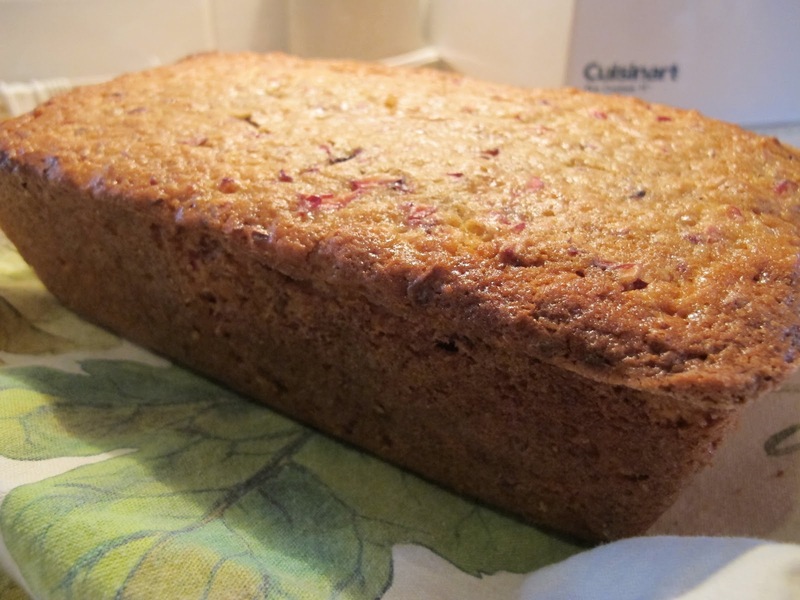 Gives your mouth a break from the heat and provides more whole grains and greens. It also lowers the cholesterol and calories of a chili meal so I can have it more often with less guilt. Here’s the base for my vegan chili. So here’s how I made this chili with brown rice today…using the leftover Election Day Crock-Pot chili and some brown rice I let cook this morning while I walked the dogs. 1. 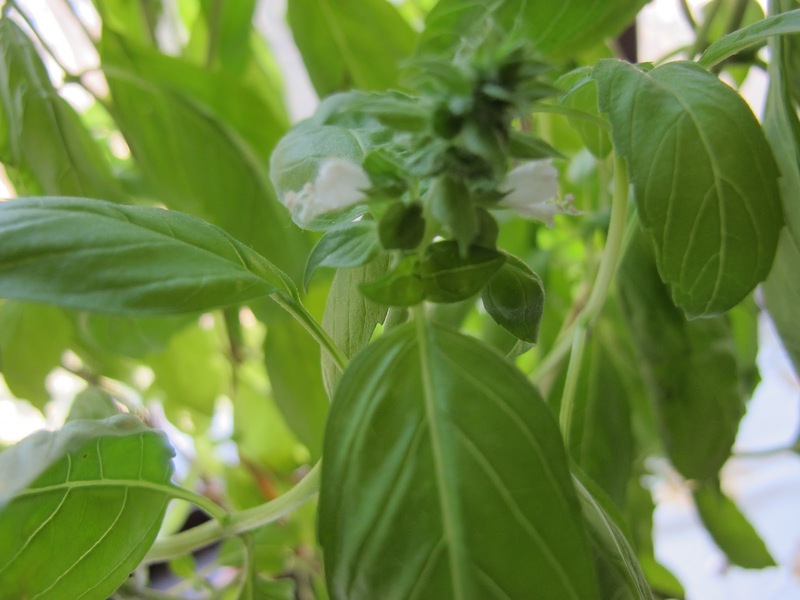 In a large shallow bowl (a pasta bowl is fine), add spinach to one corner. Top with half of the sliced shallots and sprinkle with salt and pepper. Squeeze lemon over the greens and drizzle with oil. Add cherry tomatoes at side. 2. 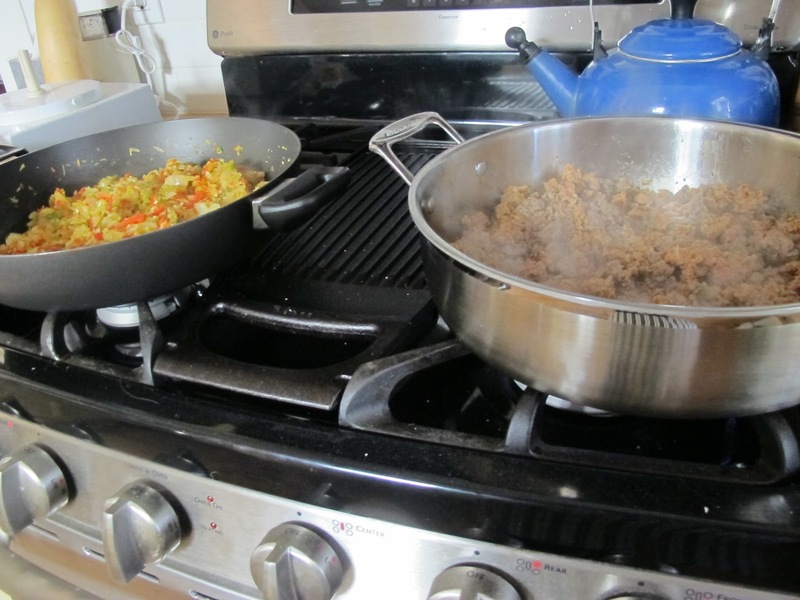 Add rice to one side of the bowl and chili to the other. Garnish with rest of shallots and a few tortilla chips. brown rice– tips and info………. 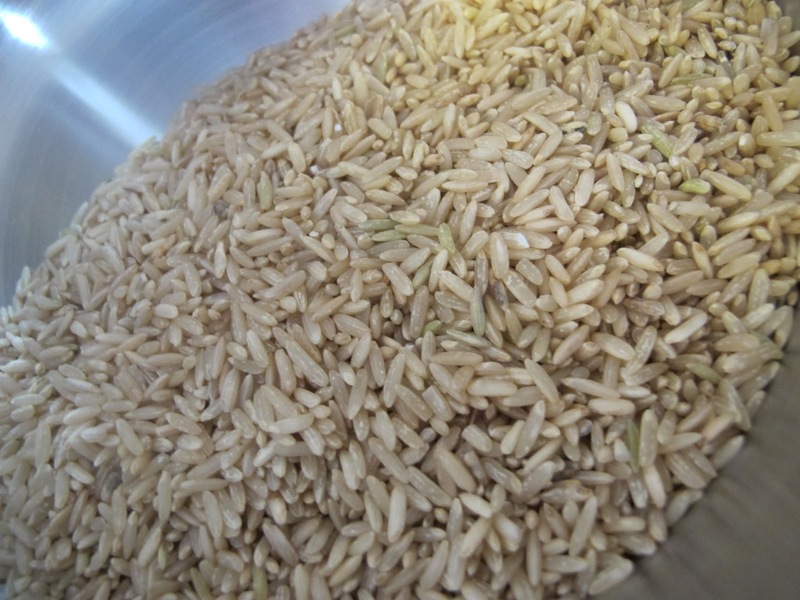 Brown rice takes about 45 minutes to cook at sea level, but quicker versions are available. Some markets even sell frozen cooked brown rice. You can also make brown rice in your crock-pot and freeze small portions for future use. And, yes, you can make brown rice in your microwave. You don’t save a lot of time, but a few minutes. The directions are on the rice bag. 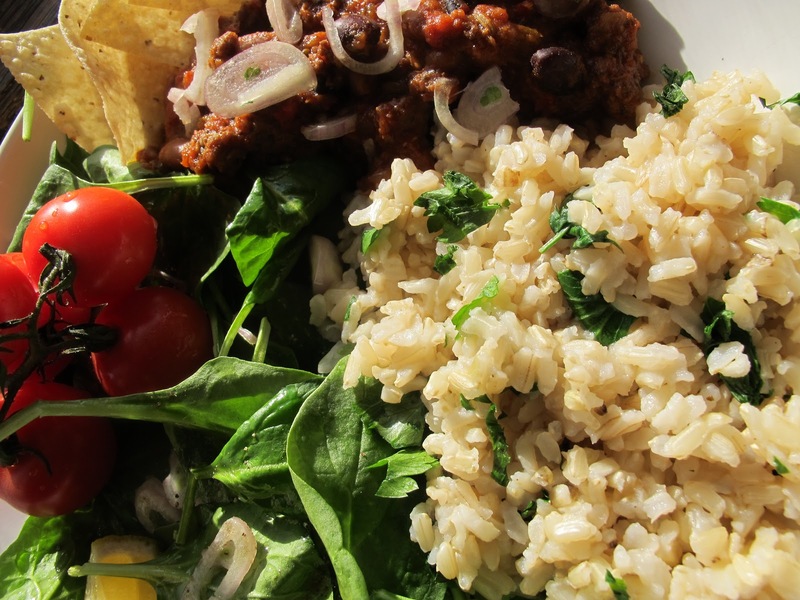 As our Power Foods group moves through the 38 Power Foods (click to order book), you’ll gather we’re up to brown rice this week. The main food for over two-thirds of the world’s population, rice is sacred to many people. 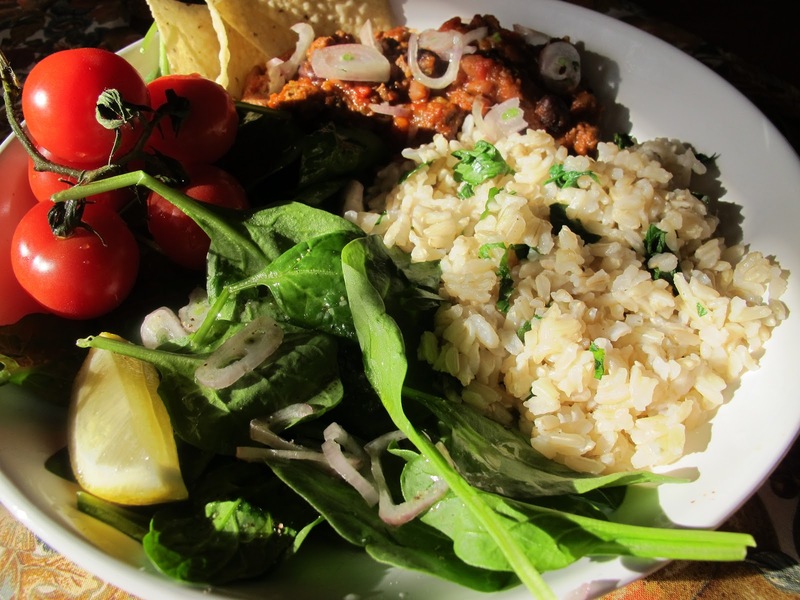 Rice is a complex carbohydrate high in protein. Did you know Arkansas is the largest rice-producing state in the U.S.? If you were raised by southerners in the United States, you grew up eating a lot of rice. Rice and gravy (or butter), rather than potatoes and gravy, were the standard at my family table. My sister-in-law, who’s Korean, keeps a rice pot hot pretty much 24-7. If her children are hungry between meals, they know where to go without bothering her. Brown Rice is Healthy! As only the hull is removed off brown rice, we have a much healthier grain to eat that actually works against cholesterol in our bodies with its larger component of fiber. You can read all about it here, but you’ll see with just a little bit of research that eating foods like brown rice works toward protecting us against heart disease, diabetes, metabolic syndrome, muscle spasms, migraines, and many other things. Tryptophan? But of course. Eat turkey and brown rice and you’re much more likely to sleep well! And best of all, if you’ve ever been on Weight Watchers, you know a cup of brown rice is four points and white is five. Who wouldn’t take the brown? With a few exceptions, I use brown rice instead of white rice for nearly everything. I draw the line (usually) at fried rice, but that’s a VERY occasional meal and I sometimes even use brown rice for that. Leftover brown rice? Make extra. Always. Rice is good food! 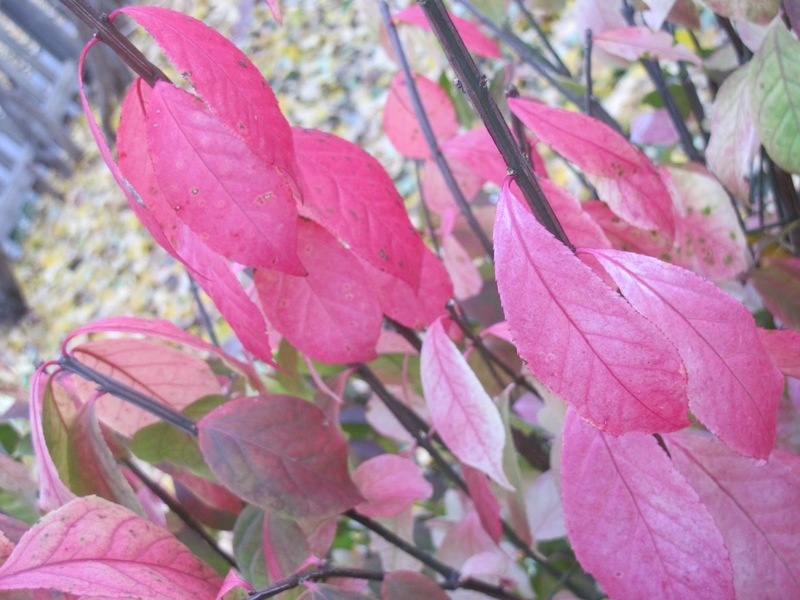 Then you can…. Add milk and a little sugar for breakfast. Stir into some scrambled eggs with cheese and green onions. Add to a burrito. Stir up a stir fry for a topping. 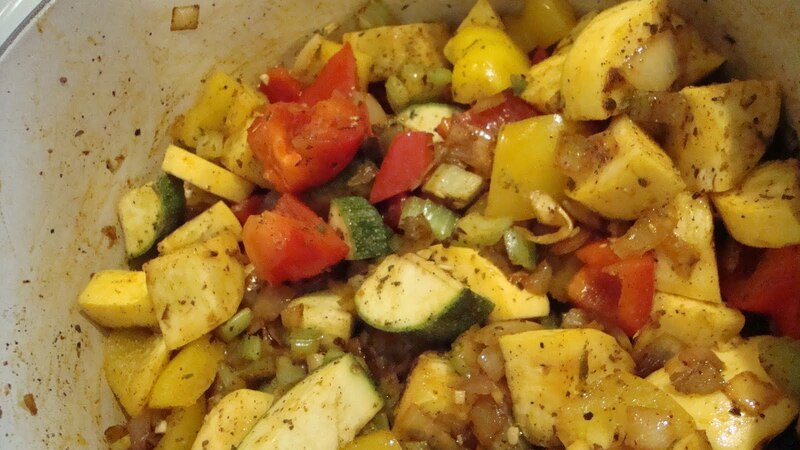 Warm well and add a teensy bit of butter and lots of pepper to eat with cooked squash. Make a patty, fry it up and make a hole in the middle. Crack an egg into the hole. Cover and cook 2-3 minutes. Add to soup or stew. Cook up Thai curry. In fact, there are so many ways to use brown rice that I know several people who just cook up a great batch every weekend and eat off it all week with whatever. The simplicity, cost, and health benefits of brown rice appeal greatly to those who don’t cook much and to those who cook often. 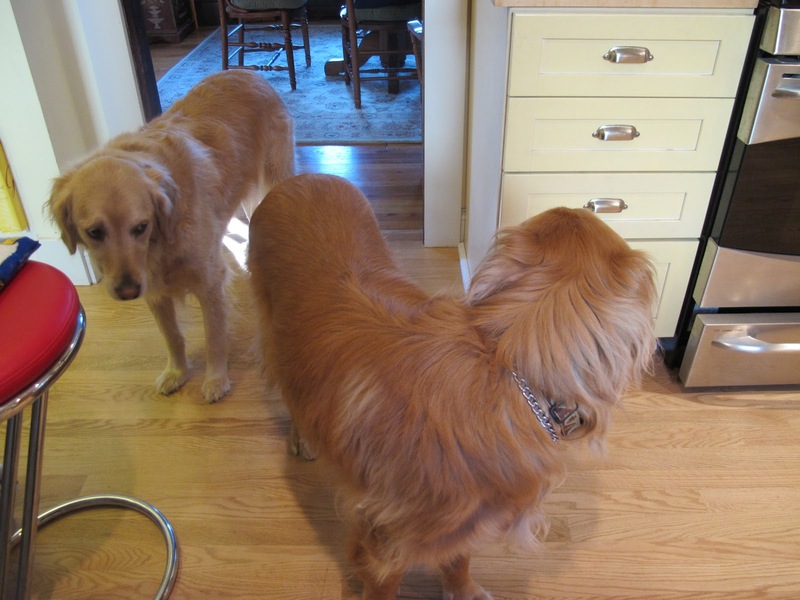 One of the favorite posts on my other blog (Dinner Place–Cooking for One) is “Help! I’ve Got Leftover Take-out Rice and Don’t Know What to Do With It.” Click and check out the recipe; it works just as well with brown rice. The sun shining on my brown rice. If you’re like me, you’ll be all over MSNBC Tuesday night like icing on wedding cake. Like blue on jeans. Like red on Merlot. Like chocolate on chips. Oh well, whatever you’re on, you might want something done and done to get you through that long night. Just, please, God…let be over and clean and obvious. No hanging anythings and the Ohio machines all working fine. I already made my chili and froze it. I just run that 4 quart container under hot water in the morning til it “pops” and then gently slide the frozen chunk into my crock-pot on “low” for the whole day. (Make sure and add a little water to the crock-pot before the frozen chili.) But since you didn’t know ahead of time…. 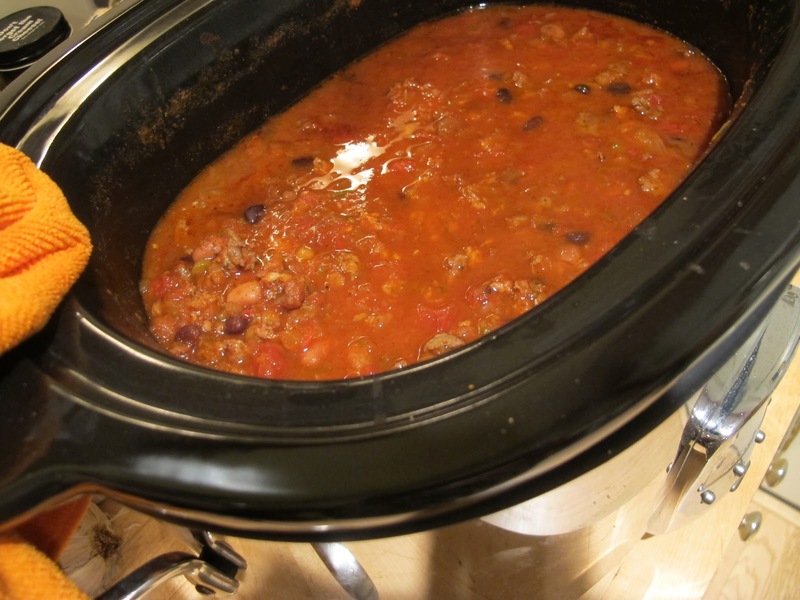 Try this spicy, filling crock-pot chili that only asks you to…. 2. 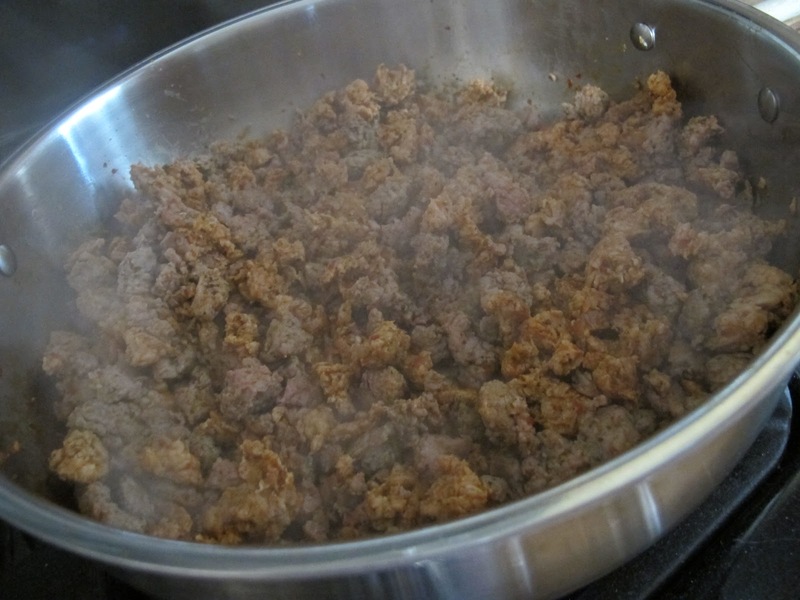 Brown 2 pounds turkey Italian sausage (1 pound each hot and sweet or to taste.) in another skillet. To speed things up, I do it at the same time. Stir well, taste and adjust seasonings. Turn crock-pot to low and cook 6-8 hours or on high for 4-5 hours. Serve hot with tortilla chips and grated cheese. Hurricane Sandy Relief: Donate to Food Bank for NYC … right after you vote! On the back porch: still ripening cherry tomatoes Dave picked 3 weeks ago. African chard from Wendy’s garden. I’m eating this in my egg-white omelets. 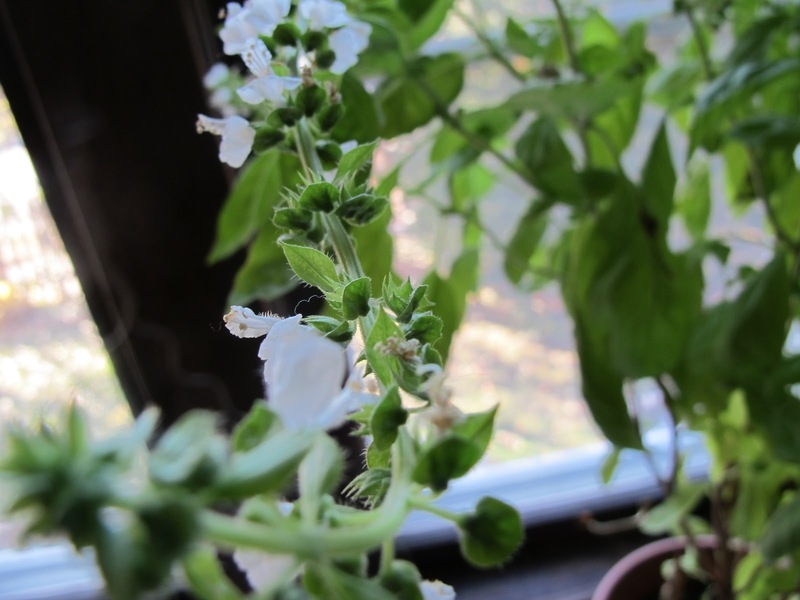 Basil growing in the south DR window. 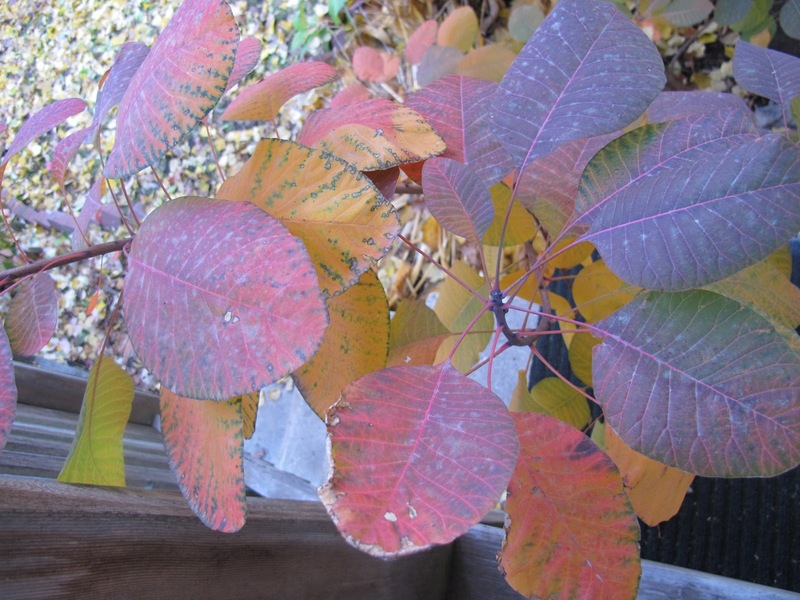 My eastern garden smoke bush. 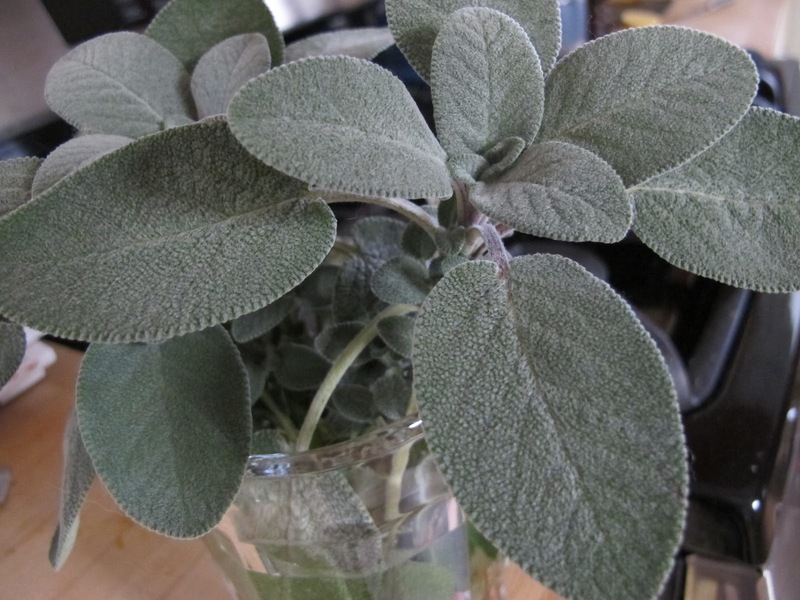 More of Wendy’s sage–picked last week and in water in a glass. Up close chard. 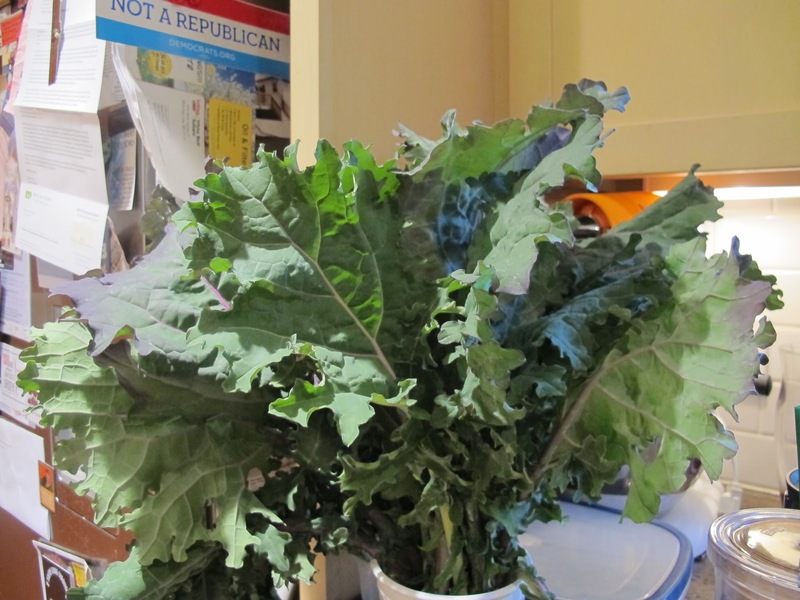 Still eating from the yard in November. Thanks, God. And I’m so glad the election is (hopefully) about to be over. Please pray for those without homes, heat, and power on the east coast. 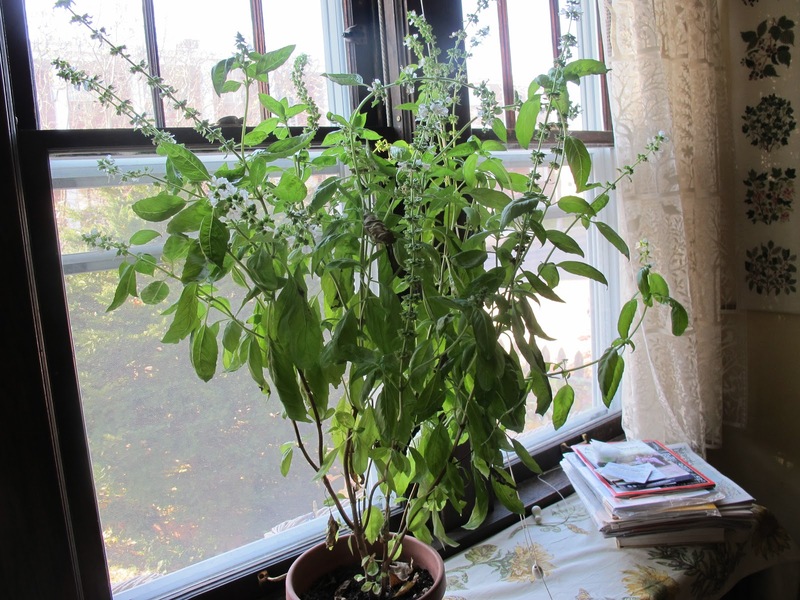 Our daughter now has power in New Jersey, but many don’t.